Colombian President Pauses Peace Talks With Rebel Group, ELN : The Two-Way It is the second time this month negotiations have been put on hold after insurgents launched a series of bomb attacks on police targets. It is unclear when negotiations will resume. Colombia's President Juan Manuel Santos has suspended peace negotiations with the nation's last rebel group after a series of deadly bomb attacks. 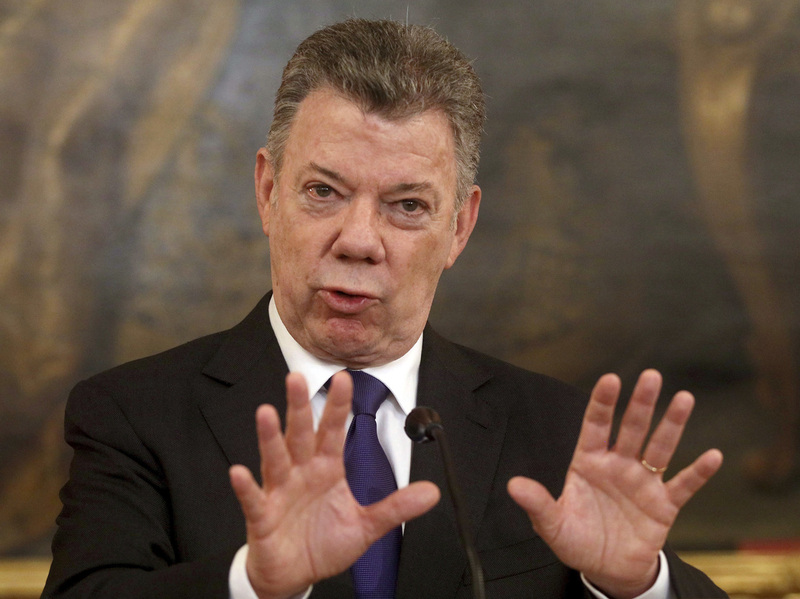 Colombian President Juan Manuel Santos suspended ongoing peace talks with the National Liberation Army (ELN) on Monday, after the leftist rebel group killed several police officers in a series of bomb attacks over the weekend. It is the second time this month, negotiations between the government and the last remaining rebel group have been put on hold. Five police officers died and more than 40 others were wounded by a homemade bomb that targeted a police station during a shift change in Barranquilla, a northern Colombian town, reports the Associated Press. Two more died hours later in separate bomb attacks on police. "My patience and the patience of the Colombian people has its limits," Santos said at an event near Bogota, according to Reuters, "so I have taken the decision to suspend the start of the fifth cycle of negotiations, which was scheduled for the coming days, until we see coherence between the ELN's words and its actions." AP says the ELN issued a statement Monday expressing support for the peace talks and the re-establishment of a cease-fire that expired this month. But it says "military actions will continue taking place on each side" in the absence of any agreement. Government and rebel negotiators have been engaged in formal peace talks in Quito, Ecuador, since February 2017. Since the cease-fire expired in October rebel fighters have been ramping up attacks on police, the military and infrastructure. In recent weeks, guerrillas have bombed major oil pipelines, killed security force members and kidnapped an oil contractor. Santos was awarded the 2016 Nobel Peace Prize for his "resolute efforts" to end the 52-year bloody civil war with the Revolutionary Armed Forces of Colombia. Under that deal, the FARC gave up its weapons and transformed into a political party. Now, one of its former leaders is seeking the nation's top office. Reaching a deal with the ELN would end all rebel conflict in Colombia. It is unclear when negotiations will resume.